My precious friend Minako first visited New York from her native Japan in the summer of 2001. While attending classes at The Art Students League; her keen eye for color matching and mixing of paints caught the attention of a fellow student. He was in need of help with the painting portion of a landmark building restoration job for the City of New York in the financial district of Manhattan. Minako happily and very successfully complied. The following day at JFK, bags checked and awaiting her departure flight back to Japan, she received a call on her cell phone. The construction company wanted her, and made a considerable job offer. A whirlwind trip back home to say goodbye to friends and family, she found herself returning to NYC, just days before the 9/11/2001 tragedy. Toward the end of the restoration project Minako noticed large blocks of beautiful marble being trashed as part of the demolition of the building. This proved to be the source of raw materials for her initial attempt at sculpture. Incredibly her first finished piece sold almost immediately and brought her an award from the National Sculpture Society, and birthed her career. She has since successfully restored the landmark sculptures of the Hearst Tower façade, and was featured in the New York Times. Her paintings have been commissioned by the United Nations. 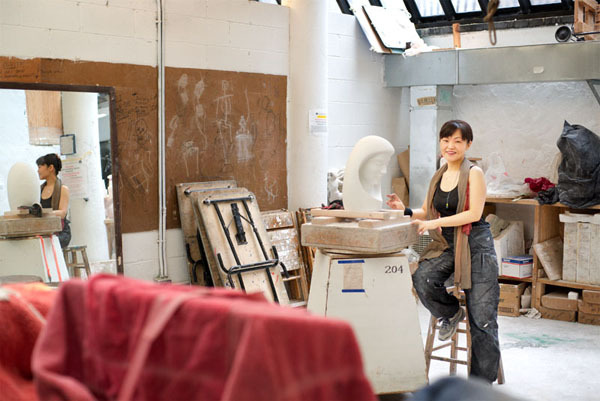 Minako lives and works in her Bushwick, Brooklyn studio, carving marble sculpture and painting. She has received a letter of recognition from the Metropolitan Museum of Art. In 2012 she completed the marble statue series “For Japan”, a tribute to her mother country following the 3/11/2011 earthquake, tsunami and subsequent nuclear crisis. Her compassion and warm smile add to her amazing gifts she freely shares with all the people she encounters. This entry was posted on Friday, June 15th, 2012 at 8:17 am	and is filed under art, artist, sculpter, Uncategorized. You can follow any comments to this entry through the RSS 2.0 feed. You can leave a comment, or trackback from your own site. Hi, your friend Minako sounds like an awesome person and artist. Using the marble from the Hearst Tower façade is genius. Good for her and good for us.